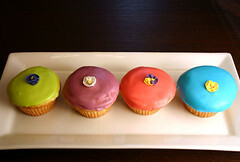 Andy Warhol-inspired cupcakes by Dozens, a new bakery in Pittsburgh. See www.dozencupcakes.com for more information. They are opening soon and will have lots of fabulous flavors including rocky road, orange blossom, the elvis (banana cake filled with chocolate buttercream and peanut butter buttercream), root beer float and pineapple upside-down. I had an awful experience at Dozen. It all stemmed from their dry, flavorless cupcakes. I emailed the store with some constructive criticism...such as adding a case of some sort that would enable them to serve fresh cupcakes. However, the cupcake proved to be the best part of my experience with Dozen (even though it was awful) as the response to my email was by no means professional and clearly showed that their customer services is obviously as lackluster as their products. They replied to my email by calling me "prejorative" and made it apparent that he (the owner) was by no means tying to apologize for the horrible cupcake. He said that they do not use display cases as they seem to be "tacky and tipical." Apparently a fresh product is tacky and tipical as well. I expected more from a place that charges nearly $3 for an average sized cupcake. The owner says in his email, "As our website expresses, we do home-style from scratch baking. It is not high-end." I think anyone would agree that their pricepoint would command a product of higher quality. Also, I mentioned in my email that I am a "food snob." Perhaps this was a poor choice of words as I can enjoy a meal from Wendy's just as much as the next guy...but i do appreciate food. This, however really angered the owner of Dozen. He said in his email, "And coining yourself a food snob only attempts to make you seem more knowledgeable than I am. I don't know anyone who would take such claims serious. It also suggests that my customers don't have a palate as refined as yours." In my initial email, I even apologized for complaining, but the owner still said that my "email approach seemed rude and aggressive." Wow! I was just telling him that I was not satisfied and offered a few suggestions. Needless to say, I won't return. A simple, "I'm sorry you had a bad experience at our store" would have make a world of difference and certaintly would have enabled me to re-try their products. omg. Can the administrator please post the IP address of the above whiny kid. I have a guess of who it might be. "I was just telling him that I was not satisfied and offered a few suggestions" and then you came to the website to complain further. Next are you going to call the BBB? Grow up. Obviously their cupcakes are kinda expensive. Too bad. Go to Costco if you want a good price on cupcakes. I bet they put a crapload of preservatives (yum!) in them to keep them eternally fresh.